Wenatchee, WA (April 30, 2017) For East Wenatchee, Washington’s Garrett Evans, the “young guns” are everywhere. They even travel with him around the northwest to race. 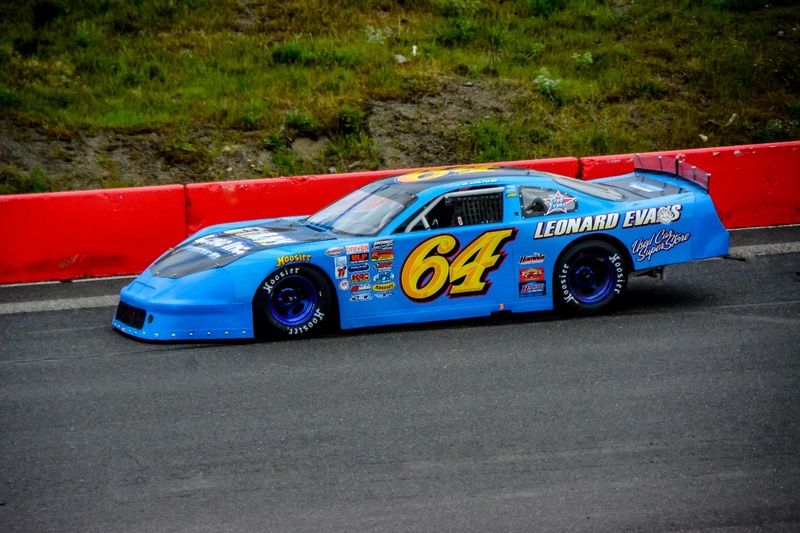 Son Jan and his sister Stephanie have stepped up to tour with the Northwest Super Late Model Series Inc. this season, where their father has been champion for the past three years (NWSLMS). Saturday night, the “young guns” gave the elder Evans a run for his money on his way to a victory in the Park Model Homes 125 at Spokane Super Oval (SSO). The wily veteran showed the up and coming drivers he is still boss, while praising their performance at the same time. “These young drivers we have coming up are phenomenal,” said Evans. “It’s unbelievable how good they’re doing, and I think the northwest has something to be proud of. Evans started fourth on the grid after qualifying third in the inverted six field. Spokane’s Braeden Havens took the lead from pole setter Jan Evans on lap 1. By lap 10 though, Evans had started reeling in Havens, with Joey Bird and Zack Beaman tagging along for the ride. Evans made the pass on Havens for the lead on lap 32. Double file restarts kept Evans on his toes, with Havens starting right by his side. On a late restart, Beaman made his presence known when as passed both third and second place positions with Evans in his sights. Beaman dove to the inside, but Evans nosed ahead. Jan Evans and Brooke Schimmel got together and brought out the yellow flag. On the restart, Beaman’s tires had cooled enough for him to make a run on the inside with Evans choosing the outside starting position. Beaman’s car stuck to the track and he made it wide enough to take the lead on lap 96. With Evans in his rear view and on his back bumper, Beaman held off the veteran. Evans stayed close and found room underneath, retaking the lead on lap 106. Evans set the cruise control and was looking for the checkered flag when Schimmel spun, setting up a green-white-checkered shootout. The double file restart had Evans, Beaman, Havens and Brittney Zamora gridded for a showdown. Beaman spun the tires and Evans pulled away to the checkered. Zamora got her nose underneath Havens to take the third position, her first podium finish of the season. Lap leaders: 1-31 Braeden Havens, 32-95 Garrett Evans, 96-105 Zack Beaman, 106-126 Garrett Evans.